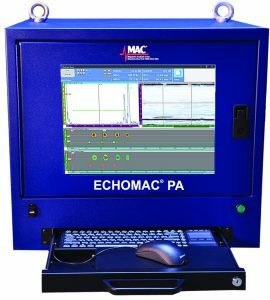 MAC introduces two versions of Rail Wheel Testers using ECHOMAC® PA platform based on customer requirements. One is a semi-automated solution using local immersion technique. Used for tread inspection of new and/or reprofiled wheels. This solution meets or exceeds EN13262, ISO5948 or AAR M-107/M-208 standards for tread inspection. The second solution is a fully automated immersion tank. 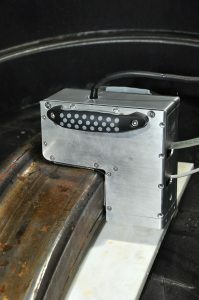 Performs tread and face inspection of rail wheels using two phased array probes simultaneously. This solution meets or exceeds EN13262, ISO5948 or AAR M-107/M-208 standards for tread and face inspection, while monitoring the backwall on the face side per EN 13262. Digital inspection data can be saved perwheel serial number for future reference.